BACKGROUND: Aspirin should not be used in children except for specific therapeutic reasons. 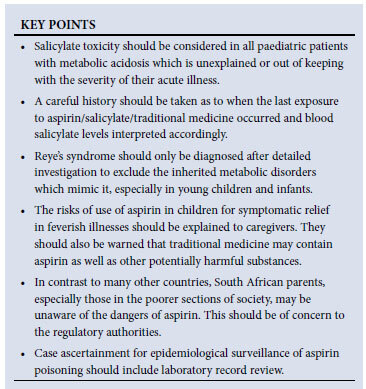 We report on a severely ill infant who had ingested aspirin contained in a traditional medicine and review 21 other patients with pre-admission non-therapeutic salicylate exposure. OBJECTIVES AND METHODS: We reviewed laboratory, clinical and poisons unit records to determine how many children were admitted to our hospital over an 18-month period with evidence of salicylate ingestion not prescribed for therapeutic reasons. We determined the source of the salicylate, elapsed time between ingestion and laboratory assay, morbidity and mortality and final diagnosis. RESULTS: Twenty-one children meeting our criteria, including 9 under 6 months of age, were admitted during this period. The most prevalent source of salicylate was over-the-counter (OTC) aspirin, but some had reportedly only been given traditional medicines. Nineteen were seriously ill, 4 died and 3 had severe brain injury. Two, initially diagnosed with Reye's syndrome, probably had inherited metabolic disorders. Only 2 patients had salicylate levels that at the time of measurement are normally considered toxic; however, the literature suggests that lower levels may exacerbate illness severity in young children. CONCLUSIONS: We found inappropriate use of OTC aspirin in children that requires explanation. There may be policy implications for the content and presentation of patient information; the incorporation of pharmaceuticals in traditional medicines merits further study. Salicylate toxicity should be considered in children with unexplained metabolic acidosis out of keeping with the severity of their acute illness. A previously well 7-week-old male infant was admitted to Red Cross War Memorial Children's Hospital (RCH) with a 4-day history of poor feeding, cough and progressively rapid respiration. His mother had consulted a traditional healer who prescribed a liquid herbal mixture. This was given for 3 days prior to admission, but the infant's condition deteriorated. No other medications were reported. On admission the child was shocked and encephalopathic with fever, pallor, marked jaundice, and an acidotic breathing pattern. Admission investigations revealed hypoglycaemia, anaemia and urinary tract infection. Escherichia coli was later cultured from an admission urine specimen. His mother brought the herbal mixture for analysis. It was in a clear unlabelled Coca Cola bottle and was green with a dense white sediment comprising 20 - 25% of the volume. A qualitative assessment of the salicylate content of the medicine indicated a 2+ level of salicylate. Independent analysis by a forensic laboratory confirmed the presence of salicylic acid. Salicylate was also detected in the patient's urine. The patient responded rapidly to treatment and was discharged well after 2 weeks with a final diagnosis of urinary tract infection complicated by salicylate poisoning. As a check on the completeness of case ascertainment, the poisons unit at RCH was asked to provide data on trends in discharges and deaths due to salicylate poisoning between January 2004 and December 2008. Cases were included on the unit's database if there had been a clinical diagnosis of salicylate poisoning based on a history of ingestion and suggestive clinical and laboratory features; confirmation by a documented blood salicylate level was not required. Salicylate levels were requested for a total of 156 patients over the 18-month review period: 25 had detectable levels, but case notes were unavailable for 5, leaving 20 available for review. The patients' ages ranged between 3 days and 6 years (median 8.5 months); 9 were aged under 6 months. There were 13 males and 7 females. Duration of admission ranged between 1 and 56 days (mean 15.7, median 10.5). Two patients were hospitalised for 2 months and 9 were admitted to the intensive care unit. Ethnic and social background. Fifteen of the 20 patients' carers were Xhosa speaking, 1 was Afrikaans speaking and 1 was English speaking; this detail was not recorded in 3 cases. Social grading was available for 18 patients and was recorded as 'H1' in all 18. This compares with a prevalence of 77.7% of H1 grading among all patients seen in the emergency unit between January 2005 and June 2006, and of 68.9% among all patients admitted to acute paediatric general medicine in this period. H1 is the lowest category and equates to a family income <R4 800 per month (as stated at registration). The geographical distribution of most of the patients' homes reflected that of the poorest parts of Cape Town. The type of housing was recorded for 15 patients: 9 lived in shacks, 5 in a brick-built flat or house and 1 in a hostel. 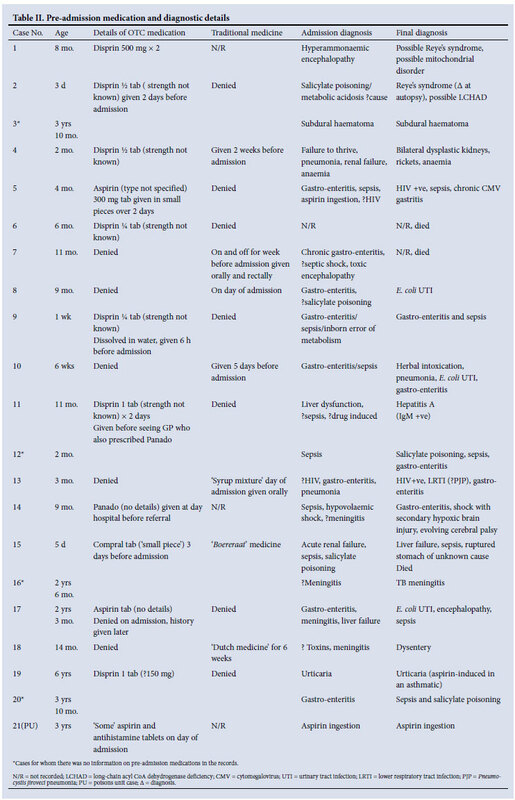 Overall pre-admission medications (Table II). A total of 16 of the 20 patients had a history of receiving medication: in 9 cases this was a pharmaceutical (8 being aspirin-containing preparations), and in 5 it was a traditional medicine. Two patients had been given both; the pharmaceuticals both contained aspirin. 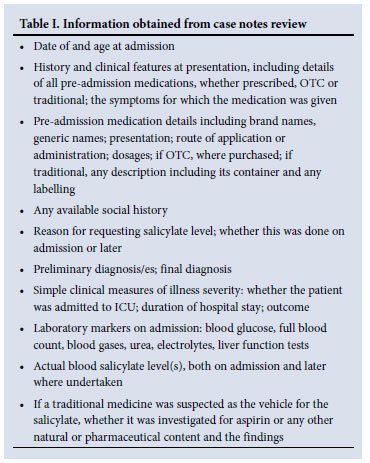 The reasons for giving preadmission medication were recorded for 10 cases; fever was the reason in only 4 cases. Other reasons included diarrhoea, cough, ear discharge, fits and 'fast breathing'. There was no clear difference between reasons for using traditional as opposed to OTC medications. In 1 case the administration of traditional medicines was initially denied by the mother and only elicited on further questioning the day after admission. Information on the source of these medicines was only provided for 1 case; it was a traditional healer. Clinical features on admission. Although clinical data were often incomplete, all patients except one were extremely ill, with a range of clinical features and patterns: 8 were described as shocked and another as 'acutely ill'; 15 had one or more abnormal neurological findings reported (of whom 7 were encephalopathic, 2 had a decreased level of consciousness, 4 were fitting and 2 had meningism); and 10 patients had an acidotic breathing pattern. Table II shows the admission diagnoses - gastro-enteritis and sepsis predominated. 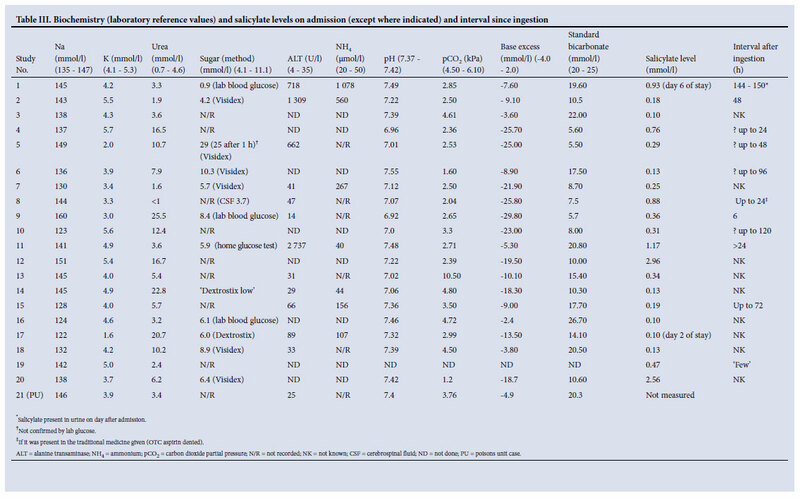 Twelve of the patients were acidotic and 1 was alkalotic; of those who had normal pH values, an additional 4 had base excess values outside normal reference range, indicating compensated metabolic acidosis. Only 2 patients' salicylate levels fell into the toxic range defined by the laboratory (>2.2 mmol/l). However, for most of the 12 cases in which the information was recorded, the measurement was not undertaken until many hours after ingestion. Although only 2 of our cases had admission salicylate levels above the 2.2 mmol/l that indicates toxicity by the laboratory reference range, this may not represent the true extent of the toxic effects of aspirin on the patients' illnesses. We cannot tell to what extent the salicylate affected outcome, but the literature suggests that it was likely to have been deleterious. A study of the age-related pharmacokinetics of aspirin showed that infants have much lower elimination rates than 10 - 15-year-olds.7 Another important consideration is therefore the interval between ingestion and first measurement of salicylate level. For nearly half of our patients the time of ingestion was unknown or unrecorded; among the rest in only 3 cases was it probably less than 24 hours, and in 1 case the measurement was done at least 6 days later. Done8 showed that this is the most important variable affecting the relationship between the level and clinical signs of toxicity in patients with accidental aspirin poisoning. 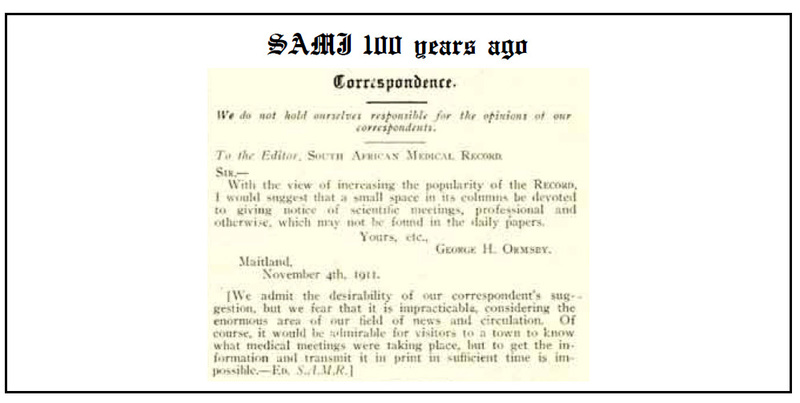 He developed a nomogram for retrospectively estimating the highest post-ingestion level based on a series of previously well subjects - the effects of age and illness were still unknown. 5. Federal Register/Vol. 68, No. 74/Thursday, April 17, 2003/Rules and Regulations pp. 18861-18869. http://frwebgate1.access.gpo.gov/cgi-bin/TEXTgate.cgi?WAISdocID=TC2kAO/1/1/0&WAISaction=retrieve (accessed 7 September 2011).